French niche line Memo will launch Ilha do Mel, a new fragrance named for the island off the coast of Brazil. Ilha do Mel is the second scent in the Graines Vagabondes series, which started with Kedu. Let us sow the seeds of delight on the Ilha do Mel, an island of sugary sweetness with the curvaceous outline of a whale. Just for you and me, honey meets mandarin — and nothing could ever tear us apart. A moon of juniper and vanilla deeply intertwined. A wave of broom flowers swells, and washes over my pillow. I have the whole wide beach to unravel you. Hidden bliss; sheltered under the pink and hyacinth arches of the Encantada grottos, we lost all reason in the labyrinth of Camoes. Rays of honey soften the jasmine of my awakening. Their sweetness gives me musk fever, the palm fronds sway with your devilish smile. King Vetiver rules, I rush to dip in the swirling waters of joy, hurry, join me in the whirl of orange blossom waves. Lonesome without iris, I long for your tropics. Ilha do Mel was developed by perfumer Aliénor Massenet. The notes include mandarin, hyacinth, juniper, broom flower, iris, jasmine, orange blossom, vetiver, vanilla and musk. 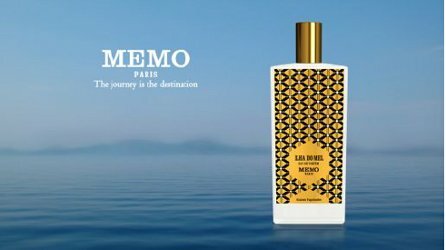 Memo Ilha do Mel will be available in 75 ml Eau de Parfum, $250. Recently discovered Memo- very good! Yeah, you don’t see it much. My local Whole Foods has a perfume oil (jojoba oil-based) — Bujari by Rare Essence/Rare Earth Naturals — that has notes of rose, broom/genet (the plant, not the animal), and tonka bean. One site says that it has frankincense, as well. Yes, and Santa Maria Novella makes a very nice one. An early contender for Le Prix Eau Faux? I think they wrote this section with Mad Libs.